Definition at line 28 of file app-layer-protos.c. alproto App layer protocol id. String equivalent for the alproto. Definition at line 30 of file app-layer-protos.c. References ALPROTO_DCERPC, ALPROTO_DHCP, ALPROTO_DNP3, ALPROTO_DNS, ALPROTO_ENIP, ALPROTO_FAILED, ALPROTO_FTP, ALPROTO_FTPDATA, ALPROTO_HTTP, ALPROTO_IKEV2, ALPROTO_IMAP, ALPROTO_IRC, ALPROTO_JABBER, ALPROTO_KRB5, ALPROTO_MAX, ALPROTO_MODBUS, ALPROTO_MSN, ALPROTO_NFS, ALPROTO_NTP, ALPROTO_SMB, ALPROTO_SMTP, ALPROTO_SSH, ALPROTO_TEMPLATE, ALPROTO_TEMPLATE_RUST, ALPROTO_TEST, ALPROTO_TFTP, ALPROTO_TLS, ALPROTO_UNKNOWN, and proto. 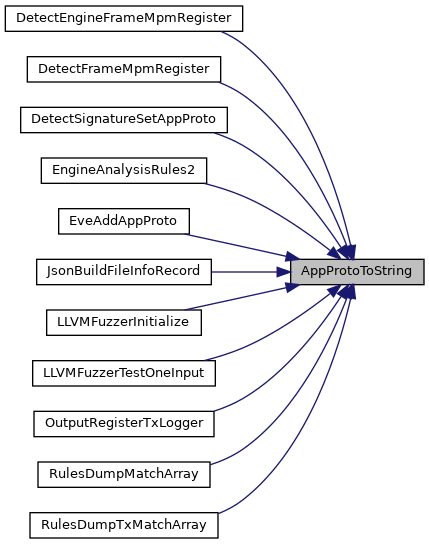 Referenced by AppLayerHandleTCPData(), AppLayerIncTxCounter(), AppLayerParserRegisterMpmIDsFuncs(), AppLayerParserStateCleanup(), DetectSignatureSetAppProto(), EngineAnalysisRules(), EngineAnalysisRulesFailure(), OutputRegisterTxLogger(), PacketCreateMask(), RunModeInitializeOutputs(), SCProfilingDumpPacketStats(), and SigMatchList2DataArray(). alproto App layer protocol id, or ALPROTO_UNKNOWN. Definition at line 122 of file app-layer-protos.c. References ALPROTO_DCERPC, ALPROTO_DHCP, ALPROTO_DNP3, ALPROTO_DNS, ALPROTO_ENIP, ALPROTO_FAILED, ALPROTO_FTP, ALPROTO_HTTP, ALPROTO_IKEV2, ALPROTO_IMAP, ALPROTO_IRC, ALPROTO_JABBER, ALPROTO_KRB5, ALPROTO_MODBUS, ALPROTO_MSN, ALPROTO_NFS, ALPROTO_NTP, ALPROTO_SMB, ALPROTO_SMTP, ALPROTO_SSH, ALPROTO_TEMPLATE, ALPROTO_TEMPLATE_RUST, ALPROTO_TLS, and ALPROTO_UNKNOWN.